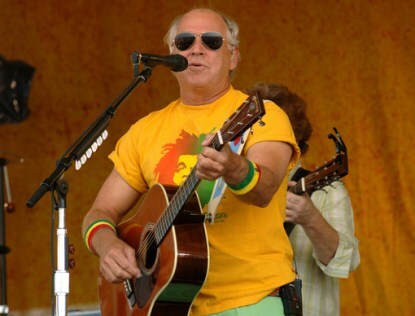 Margaritaville Singer Jimmy Buffett, 64, took a dive off the stage today while he was performing in Australia. He was taken to St. Vincent’s Hospital in Sydney after he crashed into a large gap in front of the stage during the show’s finale at Hordern Pavilion. The fall may have been caused by the lighting director. Sean Fogarty, who was also front and center, tells TMZ Jimmy was doing an encore at the end of the concert called “Lovely Cruise” and walking along the edge of the stage when the lighting person splashed “a huge flash of light” along the stage, making it impossible to see and he fell. Fogarty says the next thing he knew he heard Buffett’s head strike the metal on his way to the floor. Another audience member who was close to the stage, tells TMZ a slightly different story …. that it looked as if Buffett was about to jump off the stage to shake hands when he misjudged the jump and fell. The audience member also says he saw Buffett’s head strike a metal strip on his way down. The light flash lasted 10 seconds and no one even knew Buffett had fallen until the flashing ceased. Jimmy is in stable condition now but he is being kept in the hospital for observation. We wish him a speedy recovery!